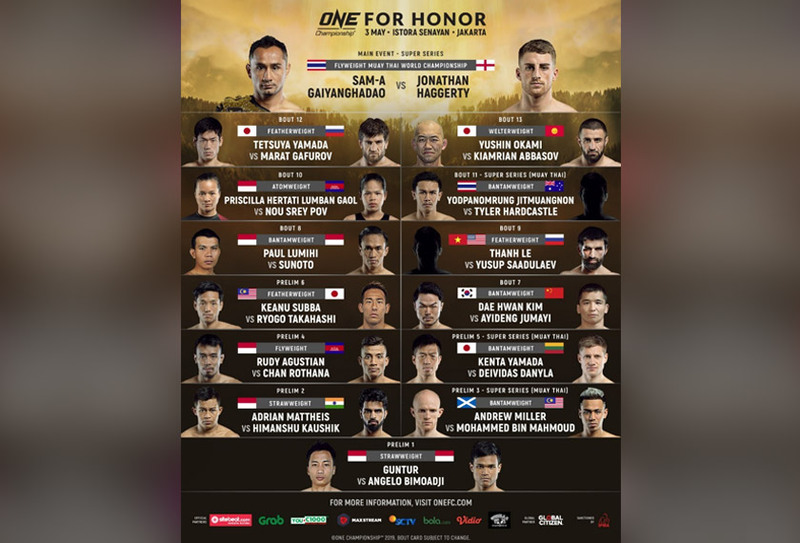 KUALA LUMPUR: ONE Championship has just announced the complete card for ONE: FOR HONOR, set for 3 May at Istora Senayan in the bustling Indonesian capital of Jakarta. Once again, the absolute best in world-class martial arts talent will storm the ONE Championship ring to showcase their incredible skills. In the main event, ONE Flyweight Muay Thai World Champion Sam-A Gaiyanghadao of Thailand will defend his title against Jonathan Haggerty of the United Kingdom. Born to a family of farmers in Buriram, a province in northeastern Thailand, Sam-A began his competitive Muay Thai career at the young age of 9. Seeking to take his career to the next level, Sam-A moved to Bangkok when he was 15 years old, and he began training at the famed Petchyindee Muay Thai academy before making his debut at the prestigious Rajadamnern and Lumpinee stadiums. His hard work and dedication soon paid off as he blazed a trail in the sport to emerge as a living legend in the ring. Haggerty quickly racked up multiple accolades in the sport of Muay Thai as an amateur becoming a three-time English Champion, three-time British Champion, and winning a European title as well. As a professional, his resume is still growing, but he has dominated almost everyone he has faced to date, winning almost all of his bouts via knockout while facing the sport's elite. Now he gets the chance to challenge Muay Thai legend Sam-A Gaiyanghadao for the ONE Flyweight Muay Thai World Title. Okami is one of the most prolific martial artists to emanate from Japan over the last two decades. With a career that began in 2002, Okami has competed in numerous weight classes -- from light heavyweight all the way down to welterweight -- in various Japanese promotions including Pride and Pancrase. A Prime Selection GP Welterweight Champion, Abbasov was raised by a single mother in his hometown of Bishkek, Kyrgyzstan’s capital city. There, he began his martial arts journey with Greco-Roman wrestling, and later added boxing to his arsenal. Early in his career, he won two tournament championships, including a one-night tournament in December 2016, where he beat three different men in one night. Today, he is one of Kyrgyzstan’s top martial arts athletes. He is now tasked to welcome Okami to ONE Championship. Yamada is a promising young martial artist with a distinct ability to seek out highlight-reel stoppages. He made his ONE Championship debut in January of 2016 in an extremely high-level wrestling showdown against Eduard Folayang of the Philippines. Former ONE Featherweight World Champion Gafurov is looking to forge a comeback trail on the way back to World Title contention. The veteran martial artist is a strong and powerful grappler, with the ability to seek out devastating submissions in any situation. Nicknamed “Cobra,” Gafurov’s constricting style has proven difficult to overcome as he has defeated some of the biggest names in ONE Championship including Narantungalag Jadambaa, Martin Nguyen, Ev Ting, and Kazunori Yokota. Yodpanomrung is considered by Thai boxing pundits as one of the top pound-for-pound Muay Thai practitioners in the world. Having 300 professional bouts under his belt, Yodpanomrung has built a reputation as being an explosive striker with stunning knockout power. He has won numerous championships throughout his career, including the WMC and WPMF World Championship titles. Indonesian national wushu champion Lumban Gaol had an exceptional 2018, competing for a total of six times and going 5-1 on the year. She has emerged as one of Indonesia’s fastest rising stars, having turned in a series of spectacular performances to captivate the local audience. On the other hand, Nou Srey Pov is a Kun Khmer World Champion with a 91-8-2 record in the discipline. She made her ONE Championship debut last February, defeating the popular Rika Ishige at ONE: CLASH OF LEGENDS. She is now looking for the second victory in her mixed martial arts career. Thanh Le sports a professional record of 8-2. A powerful striker, seven of Thanh Le’s victories have come by knockout, and one by submission. A bonafide finisher, he takes on dangerous Brazilian Jiu-Jitsu black belt Saadulaev in what should be an exciting matchup. Indonesian mixed martial arts star the “Terminator” Sunoto will also see action. The veteran athlete will face countryman Paul Lumihi, in his ONE Championship debut. Former MIMMA Featherweight Champion Subba is the younger brother of Gianni Subba, who is one of ONE Championship’s top flyweights. Following in his older brother’s footsteps, Keanu became interested in mixed martial arts in 2005, after watching a reality TV show which centered around the sport. Today, he is one of the most highly-regarded featherweight prospects in ONE Championship. Since making his promotional debut in October 2015, Subba has stopped several opponents, all in the first round. Subba is tasked to welcome newcomer Ryogo Takahashi of Japan to the promotion. In a ONE Super Series Muay Thai contest, Japan’s Kenta Yamada will meet Deividas Danyla in an exciting matchup between striking superstars. Yamada is a former WBC Muay Thai Japan Champion who hails from Tokyo. Danyla is a former IMC Muay Thai World Champion. After great success in the Lithuanian and European scene, where he captured four national and two regional championships, Danyla moved to Thailand in 2017 in search of a greater challenge. He has since faced a host of elite competition in Muay Thai, and proved he has what it takes to be counted amongst the world’s best. Agustian and Rothana are known as two aggressive offensive innovators, with Agustian coming into the matchup on the heels of three impressive victories, including two submissions. Rothana, on the other hand, is a Kun Khmer champion and a powerful striker with imminent knockout power.